Food is one of the defining features of culture. What you prepare, how you prepare it, and the occasion you are preparing it for are all important. The chefs of Polonia had the ability to cook the old world dishes, for the new world palate. If you were having an evening on the town with dinner, dancing, and drinks, they could make a light chicken that would keep you on your feet all night. If you are holding a wedding banquet, they could serve up, golabki, pork chops, pierogi, and kielbasa so everyone goes home fat and happy. Of all the restaurants in Buffalo’s Polonia that could cook like this, none was finer than the Polish Village. The Polish Village would be the life’s work of John and Florence Raczynski. The building at the corner of Broadway and Houghton had already been established as a restaurant, but the Raczynskis wanted to make it something grand. The couple began a major redevelopment of the property, remodeling the exterior into “a little bit of old Europe.” In the interior, the Raczynskis continued the Polish theme with exposed beams, a kitchen fireplace and leaded glass. Modern touches were also added including a band stage and dance floor. To add a level of sophistication, artist Joseph Mazur was commissioned to paint large murals of Polish themes including, Dyngus Day, the Turon, Dozynki, and Krakowiacy. In the kitchen, the staff created high quality home-cooked meals reminiscent of Poland, headed by a woman you could believe to be your grandmother. Besides the food, Raczynski wanted to entertain his guests. Radio stars and traveling musicians could be found on the stage, when it wasn’t being occupied by the house band, the New Yorkers. 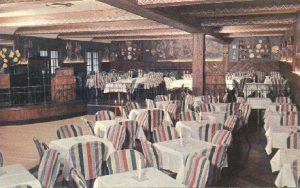 After the restaurant opened in 1947, it quickly became the hot spot of Polonia, a place to see and be seen. John, a member of the Greater Buffalo Advertising Club knew how to promote his business. He put the Polish Village brand on everything. Every table had Polish Village matches, cigarette holders, and ashtrays. If you wanted to tell an out-of-town friend where to eat, John had Polish Village postcards with the restaurant on it. The restaurant also sponsored a local baseball team, with each jersey sporting a big red Polish Village logo on the front. The Village was also well known to Poles across the country. When Liberace played the Memorial Auditorium as a fundraiser for the Polish Arts Club, the Polish Village was selected for the media meet and greet. A spread of Slavic delicacies was enjoyed after the event by the crowds while the pianist enjoyed a private dinner before the show. In 1976, John and Florence closed their Polish Village. 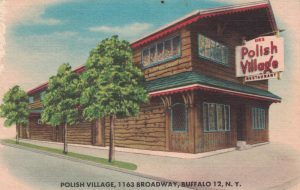 A new restaurant opened in early 1977 under the moniker, the Old Polish Village, but only lasted a few years. John Raczynski would pass away on the last day of the 1979. The Village was sold and tuned into a night club that closed in 1996. It would sit empty until August of 2009 when the City of Buffalo razed 1163 Broadway. Byrd, Chris. "Polish Village Requiem." Broadway Fillmore Alive, 25 Aug. 2009. Web. 03 Feb. 2016. Evarts, Jerry. "As I See It." Buffalo Courier-Express [Buffalo, NY] 18 Sept. 1954: 23. Print. "Liberace to Get Gala Welcome." Buffalo Courier-Express [Buffalo, NY] 5 Nov. 1954: 19. Print. "Obituaries - John R. Raczynski." Am-Pol Eagle [Cheektowaga, NY] 3 Jan. 1980: 16. Print. "Old Polish Village Specializes in Polish Food." Am-Pol Eagle [Cheektowaga, NY] 24 Mar. 1977: 13. Print. Winiarz, Francis A. "Reflections on Our Encounter with Liberace." Am-Pol Eagle [Cheektowaga, NY] 3 July 1991: 2. Print. Witul, Gregory L. "The Polish Village Was the Hub for East Side “villagers”." Am-Pol Eagle [Cheektowaga, NY] 2 Apr. 2015: 5. Print.